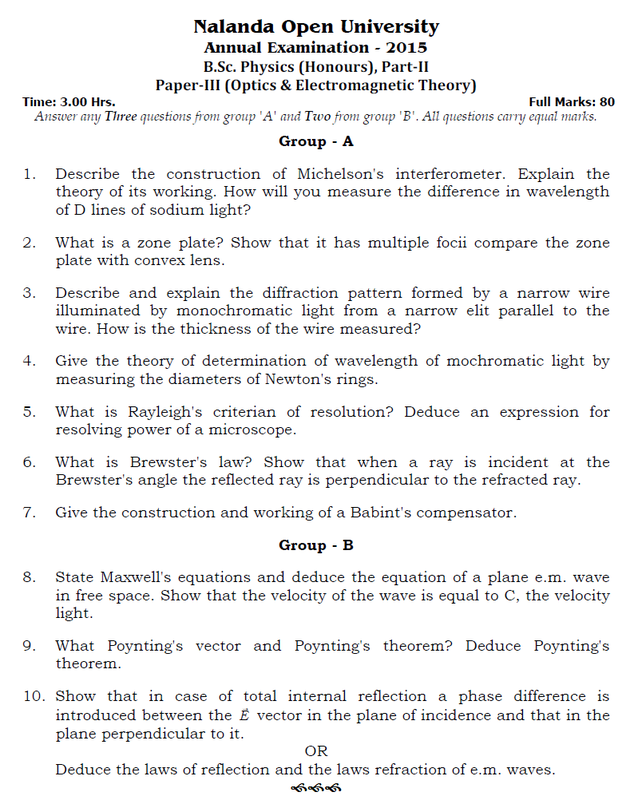 Answer any Three questions from group 'A' and Two from group 'B'. All questions carry equal marks. 1. Describe the construction of Michelson's interferometer. Explain the theory of its working. How will you measure the difference in wavelength of D lines of sodium light? 2. What is a zone plate? Show that it has multiple focii compare the zone plate with convex lens. 3. Describe and explain the diffraction pattern formed by a narrow wire illuminated by monochromatic light from a narrow elit parallel to the wire. How is the thickness of the wire measured? 4. Give the theory of determination of wavelength of mochromatic light by measuring the diameters of Newton's rings. 5. What is Rayleigh's criterian of resolution? Deduce an expression for resolving power of a microscope. 6. What is Brewster's law? Show that when a ray is incident at the Brewster's angle the reflected ray is perpendicular to the refracted ray. 7. Give the construction and working of a Babint's compensator. 8. State Maxwell's equations and deduce the equation of a plane e.m. wave in free space. Show that the velocity of the wave is equal to C, the velocity light. 9. What Poynting's vector and Poynting's theorem? Deduce Poynting's theorem. 10. Show that in case of total internal reflection a phase difference is introduced between the E vector in the plane of incidence and that in the plane perpendicular to it. Deduce the laws of reflection and the laws refraction of e.m. waves.